Step out of the city life by going to Devil's Tears and Scuba & Snorkeling. Step off the beaten path and head to Stand-Up Paddleboarding and Jungut Batu Beach. And it doesn't end there: take a peaceful walk through Mangrove Forest Nusa Lembongan, kick back and relax at Selambung Beach, tour the pleasant surroundings at Mushroom Beach, and get outside with Gala-Gala Underground House. To find where to stay, photos, and tourist information, you can read our Nusa Lembongan driving holiday planner. Salt Lake City, USA to Nusa Lembongan is an approximately 29-hour flight. Due to the time zone difference, you'll lose 15 hours traveling from Salt Lake City to Nusa Lembongan. Expect much warmer temperatures when traveling from Salt Lake City in January; daily highs in Nusa Lembongan reach 87°F and lows reach 76°F. On the 18th (Fri), you'll travel to Tabanan. Rolling green hills and rice paddy fields stretch between Bali's second-highest peak and an unspoiled coastline in Tabanan, one of the island's most geographically diverse regions. 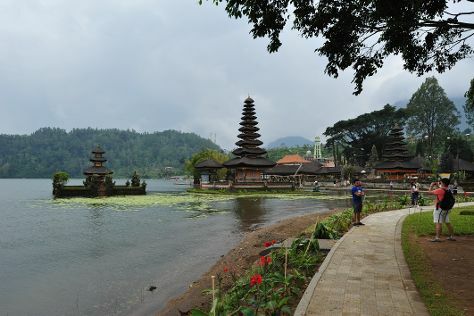 Discover out-of-the-way places like Jatiluwih Green Land and Tirta Empul Temple. Step out of the city life by going to Elephant Safari Park and Lake Beratan. Get out of town with these interesting Tabanan side-trips: Sangeh Monkey Forest (in Sangeh), Mengwi (Seseh Beach & Taman Ayun Temple) and Tegalalang (Alas Harum Agro Tourism & Sebatu). Saddle up on the 26th (Sat) and explore with a tour on horseback. There's much more to do: relax and float downstream with a rafting and tubing tour, explore the activities along Buyan Lake, take your sightseeing to a higher altitude at Batukau Mountain, and kick back and relax at Balian Beach. To find traveler tips, ratings, maps, and tourist information, read our Tabanan trip itinerary maker app . 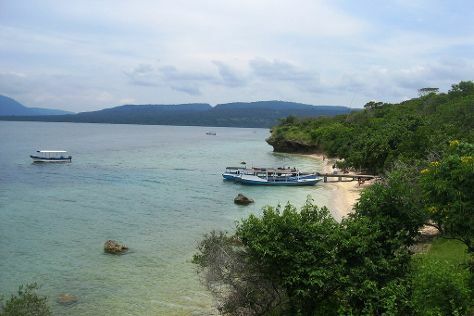 Traveling by combination of ferry and taxi from Nusa Lembongan to Tabanan takes 2 hours. January in Tabanan sees daily highs of 87°F and lows of 76°F at night. Cap off your sightseeing on the 29th (Tue) early enough to go by car to Pemuteran. Escape the urban bustle at Menjangan Island and Banjar Hot Springs. Step off the beaten path and head to Scuba & Snorkeling and Dolphin & Whale Watching. Venture out of the city with trips to Negara (Medewi & Church Of The Sacred Heart of Jesus), Singaraja (Sambangan Waterfall, Busungbiu Rice Terrace, & more) and Jembrana (Baluk Rening Beach, Perancak Beach, & more). Spend the 9th (Sat) exploring nature at West Bali National Park Forest. There's much more to do: look for all kinds of wild species at Biorock Pemuteran bali, take in the awesome beauty at Trekking Table Stone Hill, enjoy the sand and surf at Karang Sewu Beach, and witness a stunning natural landmark at Banyuwedang Hotspring and Explore Bali barat. To see traveler tips, more things to do, reviews, and more tourist information, refer to the Pemuteran trip planner . Traveling by car from Tabanan to Pemuteran takes 2 hours. Finish your sightseeing early on the 9th (Sat) so you can drive to Amed. Step out of the city life by going to Scuba & Snorkeling and Mount Agung. 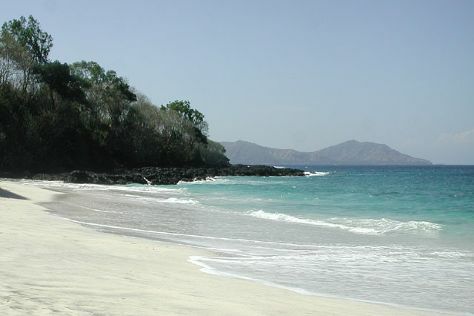 Step off the beaten path and head to White Sand Beach and Amed Beach. Venture out of the city with trips to Karangasem (Bias Putih Beach, Asah Hill, & more), Manggis (Lake Yeh Malet, Blue Lagoon Beach, & more) and Tukad Cepung Waterfall (in Tembuku). And it doesn't end there: tour the pleasant surroundings at Jemeluk Beach, enjoy the sand and surf at Lipah Beach, contemplate the waterfront views at Telaga Waja River, and experience rural life at Side By Side Organic Farm. For reviews, photos, and tourist information, you can read our Amed trip builder website . Traveling by car from Pemuteran to Amed takes 3 hours. Alternatively, you can do a combination of taxi and bus. In February, plan for daily highs up to 88°F, and evening lows to 74°F. Finish your sightseeing early on the 20th (Wed) to allow enough time to drive to Nusa Dua. A trip to Nusa Dua offers a chance to enjoy sandy beaches and an 18-hole golf course. Step off the beaten path and head to River Rafting & Tubing and Geger Beach Nusa Dua Bali. Get in touch with nature at Kuta Beach - Bali and Bali Jetpacks and Water Sports. Venture out of the city with trips to Pecatu (Uluwatu Temple, Bingin Beach, & more), Seminyak (Seminyak Beach & Spas & Wellness) and Kuta (Balangan Beach & Dreamland Beach). Next up on the itinerary: identify plant and animal life at Sacred Monkey Forest Sanctuary, relax in the rural setting at Tegalalang Rice Terrace, make a trip to Tanah Lot Temple, and cool off at Waterbom Bali. To find reviews, traveler tips, and more tourist information, refer to the Nusa Dua trip planning site . Drive from Amed to Nusa Dua in 2 hours. Alternatively, you can do a combination of bus, ferry, and taxi; or take a bus. In February, daytime highs in Nusa Dua are 87°F, while nighttime lows are 76°F. On the 7th (Thu), you'll travel back home.